If you’re planning your menu for June, there are a few holidays to consider and many fresh fruits and vegetables coming into their summer peak. Full Moon on June 27th, called the Strawberry Moon because it indicated when the berries were ready for harvest (called the Rose Moon in Europe where strawberries were not indigenous). 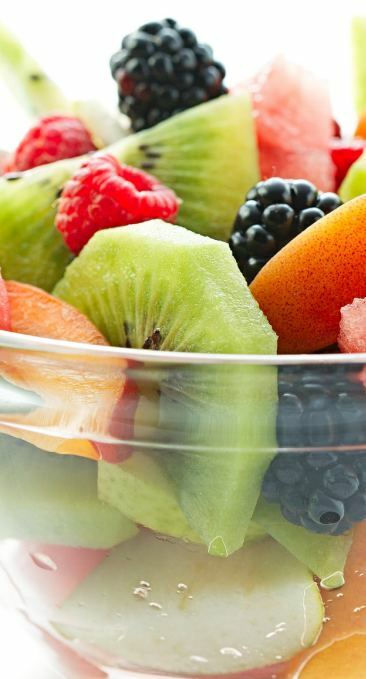 June is National Dairy Month, Get Outdoors Month and National Fruit and Vegetable Month! Full Moon on July 27th, called the Full Buck Moon or the Thunder Moon. July is also the month of Wimbledon and the Tour de France. Exotic flavors of lychee and rambutan (the hairy lychee) balance the down-home goodness of sun-ripened Stonefruit of all varieties; now through September…. YUM!! Great onion combinations – Torpedoes continue, the end of spring garlic and scapes, baby purple scallions and sweet onions from Georgia and Hawaii are available. Culinary tidbit: The sweet onion is actually a variety called granax. The names attached to the allium – like ‘Vidalia’ or ‘Maui’ refer to the growing regions, not the variety of onion. Thus, sweet onions could also come from Bakersfield or Des Moines and the determining factor of their flavor and sweetness is the mineral base in the soil and the pyloric acid content. June is the beginning of the parade of summer fruits and vegetables: legumes, melons, stonefruit and the traditional strawberry season. Gone are the earthy flavors of spring (Ramps, Morels, fiddleheads and Miner’s Lettuce) and what now begins to season our plates and our diets are flavorful bursts of sugar and starch. Summer Corn begins and this handheld delicacy contains all the starch and sugar anyone could wish for… The fig trees have an initial burst of fruit and then gap for about five weeks while the new fruit continues to ripen. Full harvest is generally more abundant mid-July. The big option coming onto the marketplace is delectable chin-dripping stonefruit – drupes of all types (except the later harvested almonds and mangoes from other places) – are becoming available. Use the perfect orbs as a singular dessert or cut up the less beautiful but equally flavorful fruit for cobblers and compotes, or even as delicious sides with savory proteins. Apricots are the least plentiful so get them while they are fresh and ripe – they can be preserved or frozen to maintain that delicious flavor a tad longer. California cherries run through Father’s day with a taper at the end of the month. There is usually a short supply of sour or Montmorency cherries just before the beginning of July. Santa Rosa plums lead the plum parade with Peaches available now through early October! Don’t fall in love with just one variety as the options change weekly, especially with small farms. Keep peaches out at room temperature to ripen perfectly; cold will arrest their development, but they can be kept in a walk-in until ready to be tempered. 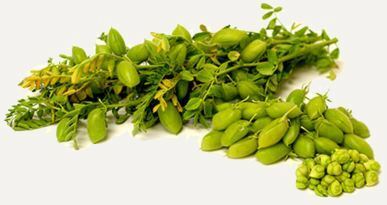 Fresh California Garbanzo beans and wild sea beans become available in June, right around the summer solstice (June 21st), also known as the first day of summer. Flowering herbs continue through the end of the month and lemon verbena becomes one of the favorite flavoring ingredients of the months – rich and aromatic with lemon flavor and scent, this herb makes an incredible simple syrup for desserts and an addition to vinaigrettes and marinades. Summer squash becomes available in most locales in June and still has that ‘new-kid’ culinary appeal that makes it delectable. It’s not until August that we are fed-up with this cucurbit! While in the same genus as Butternut, Hubbard and Acorn, all summer squash has a soft outer shell covered with nearly invisible hairs. These hairs are pest deterrents and keep bugs off of the squashes delicate skin as it develops. All summer squashes can be cooked (or not) in the same manner as they are interchangeable in flavor. A recipe for zucchini can be applied to patty pan or crook-neck, eightball or grey squash with the same success. The older the squash, the larger the seeds and internal seed pocket – this big specimen is better for bread and other applications where it’s not a solo star. Depending on the temperatures, this is when the first of the legumes start appearing – bush beans, pole beans and intermediate beans all need heat and time; they really hit their production in July. There are three stages in bean production and harvest: fresh snap, fresh shelling and dried shell. But more about this in July! Start phasing out the last of the blood oranges (usually the Sanguenielli variety is the last available), Meyer lemons and other winter based citrus. (Meyer lemons are coming from New Zealand if don’t mind paying airfare.) All Fiddleheads are done by the middle of June and we look for fruit and vegetables that absorb sunshine and thrive. Remember that the items in BOLD will prove to usually be better values as they are in their peak harvest or storage period.